with South Korea near the Chinese coast has China fuming. Has China been too restrained by not building an aircraft carrier of its own? According to this article from China's state-run Global Times, America's recent military exercises with South Korea near the Chinese coast is all the reason Beijing needs to set aside any misgivings and begin construction. 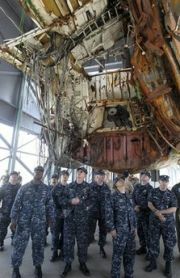 USS George Washington crew members inspect the wreckage of South Korean naval vessel Cheonan, at Second Fleet Naval Command in Pyeongtaek, South Korea, July 22. 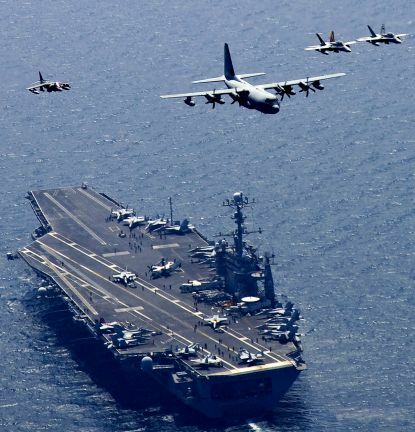 An American aircraft carrier is on its way to the Yellow Sea. In Lianyungang, I feel the threat that the United States poses to China very deeply. 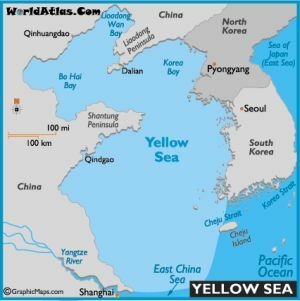 The term "Yellow Sea" refers to the waters north of the line between the Yangtze River estuary and Jeju-do Island. I live on the west bank of the Yellow Sea, across from South Korea. The sea is shallow, and considering the huge draft of an aircraft carrier, any military exercises would need to be held far from the coastline. Even if a carrier entered near the Daheishan Island Group, it's still very close to China. It feels to me that a U.S. carrier battle group has come knocking on the door, and could launch a carrier-based air attack within 40 minutes, not to mention its numerous cruise missiles. While the world at large stresses the threat from China, personally, I'm feeling threatened by the United States. After having looked over the map for a long while, I cannot help but have a few questions: First, what strategic task has been assigned to this navy? Why isn't the United States afraid of the Chinese Navy, to the point that it is actually sailing its carrier right into Chinese coastal waters? Second, if the Chinese navy entered international waters between Okinawa and Miyako Island, it would be depicted by the world as a maritime aggressor. It seems the Chinese Navy can do nothing but sit in its own doorway. When the U.S. engages in military exercises in the Yellow Sea, does it seriously consider the feelings of the Chinese people? How would it feel if the Chinese Navy and Cuba held exercises in the Gulf of Mexico? Third, wherever an aircraft carrier goes, it makes a political statement. When a U.S. aircraft carrier sails into the Yellow Sea, it exceeds the reasonable expectations that China harbors toward U.S. military power. Now, some Asian countries are eagerly moving closer to a resurgent American presence in Asia, and even contemplating collective action to contain China. So what should China's strategy be? The Chinese Navy has always hoped to have its own aircraft carrier, but politically we've had to take the feelings of our neighbors into account. But because of the current situation, I think China shouldn't hesitate; it should immediately announce the construction of an aircraft carrier. Given the Realpolitik "balance of power" principle adhered to by so many Asian countries, the currently balance of power is not conducive to China. The situation requires Chinese, through our own efforts, to restore that balance. China and the two Koreas. This past summer, the United States considered sending a carrier into the Yellow Sea, but hesitated and at last decided against it. Now it uses the Korean conflict and the need to deter North Korea to justify doing so (concluding that Chinese society wouldn't oppose its actions as it did last time). Now it can kill several birds with one stone: frighten North Korea; reassure South Korea; and "break the rules" for a few months to show its contempt for the feelings of Chinese society. China must strongly oppose such a strategy. In terms of military tactics, the construction of an aircraft carrier should be announced as a way of fighting back. If China announces the construction of an aircraft carrier, it will not be to flaunt its superiority (as the U.S. does with its more than ten carriers in the world's major waterways), but to defend China's territorial security and demonstrate its deterrent capability to foreign military powers who might wish to provoke China. This is the basic goal of building a Chinese aircraft carrier, and it is legitimate and reasonable to do so. Ensuring the safety of territory and surrounding waters is the indispensible duty of any national government. In the past, the Western media has always yelled about the "Chinese military threat," but with an American aircraft carrier in the Yellow Sea we can see how weak China really is. But at least it provides us with a good opportunity to realize once again the downside of lacking an aircraft carrier and step up our actions in the direction of producing one. Now is the time to officially announce the construction of a carrier, while it will meet with minimal resistance from the outside world. *Sun Peisong is directory of the Jiangsu Lianyungang Development Research Institute.